Published: Nov. 15, 2017 at 12:39 p.m. Updated: Nov. 15, 2017 at 02:04 p.m. It was two days after the most difficult day in the pocket of his career. Dak Prescott was sacked eight times in Sunday's loss to the Atlanta Falcons, with Adrian Clayborn registering a whopping six of them. Undeterred and ready to move on to this week's game against the Eagles, Prescott was asked how his body is holding up after the physical punishment. "Oh, physically, I'm fine," Prescott told NFL.com by phone on Tuesday, moments after ringing the Salvation Army Bell in Tostitos Championship Plaza at The Star. "I played this game of football since I was eight years old and I've had games like that. They're not very fun. But I take care of my body, and am ready to get back this week." The focus this week? "Getting back to basics and helping this team," he said. Prescott was sacked eight times, twice as much as his game-high from last year against the Redskins. 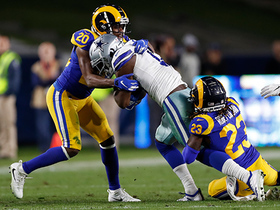 The rough day came without running back Ezekiel Elliott, who served the first game of his six-game suspension for violating the NFL's personal conduct policy. 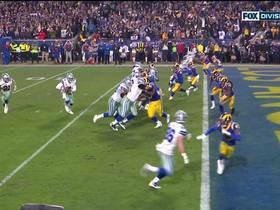 But Prescott was under duress all game in part because franchise left tackle Tyron Smith was out because of back and groin injuries. Smith won't practice on Wednesday, but I'm told the team is "hopeful" he plays Sunday night. Coach Jason Garrett told reporters they should've given fill-in Chaz Free more help. Either way, the second-year Cowboys QB says there were lessons to be learned. As he looks forward to Sunday's rivalry game against the high-flying Eagles, he knows it can't be the same story in the pocket. The Eagles are in the top half of the league in sacks, so the challenge will be similar to the one he faced against Atlanta. 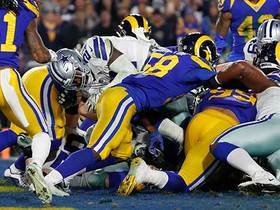 "We learned a lot from last week," said Prescott, who was 20 of 30 for 176 yards. "It was a tough game in the protection, as you saw, it was obvious." 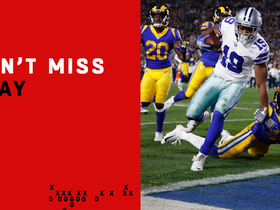 Prescott made sure it wasn't just his offensive line that received the brunt of the attention. "Some of the receivers got to do a better job of getting open faster," he said. "I've got to do a better job of getting the ball out of my hand. So it wasn't just all on the protection. It was a team loss, and everybody played a part." Before he shifted the focus to football, Prescott spoke at a promotional event for his partnership with the Salvation Army and Tostitos, which debut a bite-size yellow corn chip that Prescott called his "new favorite game-day snack." Asked why he chose this partnership to focus on, Prescott said it was an easy call. "Who else better than the Salvation Army to team up with during the holiday season?" he said. "It's a great organization, and they do a great job of giving back directly to the individuals that need it. With every purchase, Tostitos will make that donation to the Salvation Army and give everyone a chance to give back to the less fortunate. It's an organization where you guarantee it's going directly to the people who need it."